Perform the user registration to "SAi Cloud Connect". To use the Cutting Master 4, you may perform the user registration. Start the SAi Cloud Connect. For Win: click "SAi Cloud Connect" icon from the "Task Manager". For Mac: click "SAi Cloud Connect" icon from the menu bar. "SAi Cloud Connect" screen is displayed. Click "Need an account? Sign Up". * If you already have an account with SAi, enter your email and password to log in, then go to step 10. Enter your email address for product registration in email field, then click [Sign Up] button. This screen switches to the screen asking for the confirmation of received email. Enter necessary information. The "*" Asterisk indicates the mandatory field, then click [Create Account]. Click [I accept the terms and conditions] button. 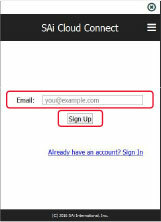 Below screen will be displayed, enter the registered email and password, then click [Sign In] button. Enter the registered email and password, then click [Sign In] button. Sign-in is displayed on the screen.